West Ham were denied what would've been a much-deserved point at Old Trafford by yet another dreadful call from the match officials. As has frequently been the case in the past against the Reds, the Hammers were left feeling aggrieved when a perfectly good goal was incorrectly adjudged to have been scored from an offside position by Felipe Anderson. And ultimately it was to cost West Ham dearly as two penalties for the home side (naturally) were enough to seal all three points for Ole Gunnar Solskjaer's side, whilst Felipe Anderson's (eventual) equaliser, early in the second half proved to be a mere consolation effort. Manuel Pellegrini, who insisted earlier in the week that his team would produce a much-improved performance was proved right as West Ham largely dominated the game, far more so than in any recent trip to Old Trafford. 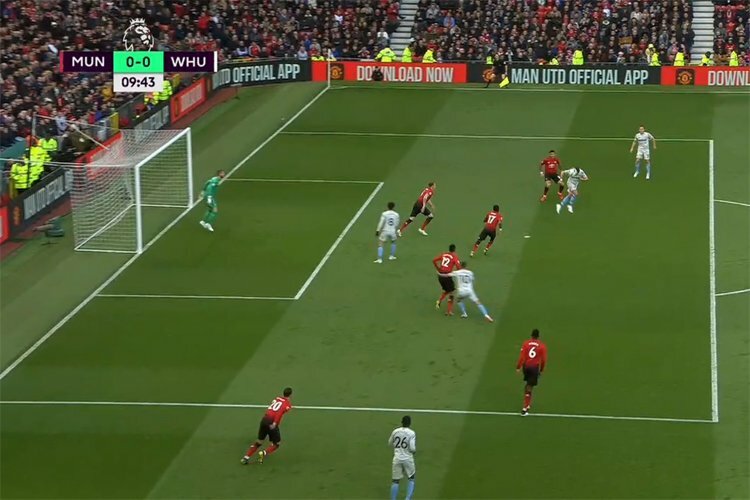 And when Anderson turned sharply before firing past a prone David De Gea in the ninth minute, West Ham thought they'd grabbed their reward for an impressive start - only to see the effort ruled out for offside, despite Man Utd's Diogo Dalot clearly playing the Brazilian ONSIDE. So it was that the opening goal of the game arrived ten minutes later when Paul Pogba converted a spot kick, after referee Graham Scott determined that Robert Snodgrass had fouled Juan Mata inside the penalty box - which even replays failed to confirm. Undeterred by the injustice of it all, West Ham came out of the blocks for the second half determined to continue the first half's good form and within four minutes of the restart, were level - largely thanks to the anticipation of Declan Rice. The young Hammer was alert enough to spot De Gea's early throw and intercept, before the ball eventually fell to Anderson at the far post where the winger was perfectly stationed to prod the ball over the line. Thereafter West Ham went from strength to strength and the best chances of the half both fell in the space of a few minutes to substitute Michail Antonio, who hit the bar with a thunderbolt of a shot before forcing a top-class save from De Gea to deny a goalbound header. Agonisingly, with just ten minutes of normal time remaining the freshly-introduced Ryan Fredericks was left in a race on goal with Antony Martial and took the striker's legs away just as he was poised to shoot. There was no question that this was a penalty and Pogba stepped up to fire home what proved to be the winning goal as once again, West Ham were sold a raw deal in Manchester. West Ham Utd: Fabianski, Zabaleta (Fredericks 76), Balbuena, Ogbonna, Masuaku, Rice, Noble, Anderson, Lanzini (Diangana 62), Snodgrass, Hernandez (Antonio 72). Subs not used: Adrian, Diop, Obiang, Holland. Manchester Utd: De Gea, Dalot, Jones, Smalling, Rojo (Pereira 75), Mata (Rashford 55), Fred, Pogba, Lingard, Martial, Lukaku (Greenwood 75). Subs not used: Romero, Lindelof, Darmian, McTominay. Goals: Pogba (pens 19, 80).